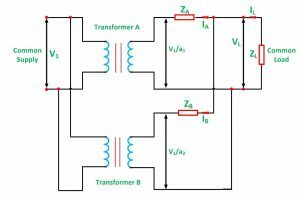 It is required to connect a second transformer in parallel with the first transformer if the load exceeds the rating of the transformer shown in Figure 1.46. The primary windings are connected to the supply bus bars while the secondary windings are connected to the load bus bars. During paralleling of the transformer, similar polarities of the transformers should be connected to the same bus bars shown in Figure 1.46. Otherwise, the two emfs induced in the secondary windings with incorrect polarities will produce the equivalent of a dead short circuit shown in Figure 1.47. 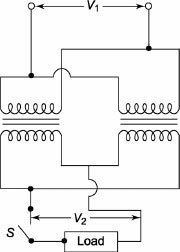 The voltage ratings of both the primary and the secondary of the transformers should be identical. Small differences are permissible if the resultant circulating currents can be tolerated. The connections of the transformers should be proper with respect to their polarities. The percentage impedances should be equal in magnitude and the X/R ratio must be the same to avoid circulating current and operation at different power factors. The equivalent impedances must be inversely proportional to the respective kVA ratings. 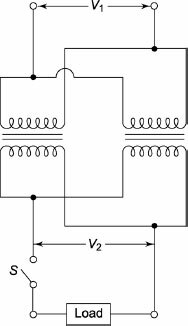 The above conditions must be satisfied by paralleling transformers of identical ratings of the same make/model. With different kVA ratings of even the same make/model, the effects in steps 1, 2 and 3 may appear in undesirable amounts. Step 2 must be carried out satisfactorily even if steps 1, 3 and 4 are slightly modified.